Prep Time: 10 minutes Total Time: 6 hours, Serves: 8 Ingredients: 2 packages of Baltalı Goat Milk Strained Yoghurt 1/2 cup of Baltalı Goat Milk 1 table spoon of quinoa (if you like) 1/4 cup of honey 1 ripe kiwi, peeled and coarsely chopped 2 peaches, peeled and coarsely chopped Directions: 1. In a blender or food processor purée the yogurt, milk, honey and peaches. If you don’t have a blender or food processor then simply stir together all the ingredients in a large bowl. 2. You can add a table spoon of quinoa to the mixture for taste and stronger health. 3. 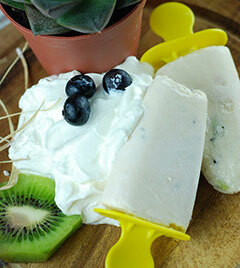 Sprinkle kiwi pieces into each of the popsicle molds. Divide the Baltalı Goat Milk Strained Yoghurt-Baltalı Goat Milk-Peach mixture over top of the kiwis. Insert popsicle sticks and freeze until firm, about 6 hours. 4. To release popsicles, run the bottom of the popsicle mold under hot water for 10 seconds and gently pull on the popsicle stick to release. There you have a delicious and a healthy Baltalı Goat Milk ice-cream for your loved ones and children that have no additives or preservatives in it. Enjoy!